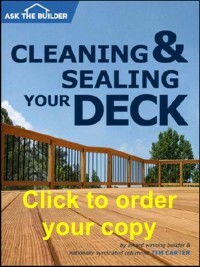 After cleaning your deck or wood porch with oxygen bleach and let it completely dry, it is time to seal the deck. This new synthetic resin epoxy fortified sealer works great. The epoxy is the key to this sealer. A lot of sealers contain natural oils that are food for algae and mildew. That's way your deck turns either black or green. This sealer does not have the natural oils to feed the algae. The epoxy grabs onto the wood fibers and holds tight allowing it to last a lot longer than normal sealers. In the can, it appears to have a milky chalky appearance, but once dry it is semi-transparent. This gives an almost furniture like appearance to the wood. For best results, two coats are required about an hour apart. Use a nice wide brush for applying and don't leave any extra sealer. Follow the label instructions and you will have a nice, long-lasting sealed deck.